0 Comments Published by Cedric Benetti on Wednesday, April 14, 2010 at 4/14/2010 07:57:00 PM. It's always something to stroll through the Louvre: too many tourists that make you feel like you're in a shopping mall, the smell of food and bad breath hangs in the air, and in the middle of it all, an art collection begging for more peace and quiet of the olden times. The appartmnets of Anne d'Autriche still being used as sculpture gallery. No big changes here. An empty hall now, but filled woth the greek and roman antique marbles. Do I smell someone eating a sandwich in a corner? The salle des Empereurs is 'en travaux', let's hope they also manage to repair that major crack in the ceiling painting. 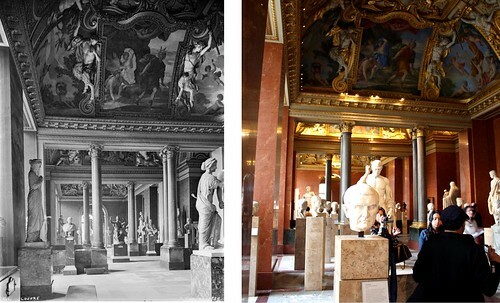 The period rooms of the old musée des Souverains, serving nowadays as space for the egyptian collection. It had more style when that alcove was filled with an actual bed, though not an accurate one. 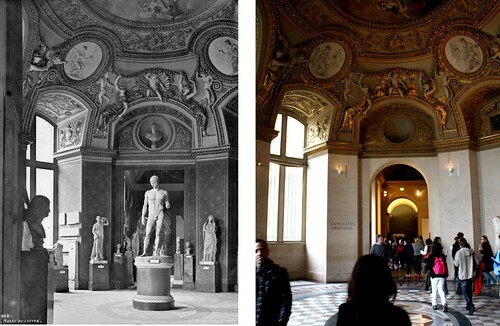 The Musée Charles X rooms still look the same, allthough the mass of exhibits has diminished to calm down the eyes.